In principle, making your dry wine into a sweet wine involves no more than adding ordinary sugar. The only problem is that it was sugar that fed the yeast to make alcohol, and if you're not careful the yeast will start on the sugar that you want to leave in the wine to make it sweet. 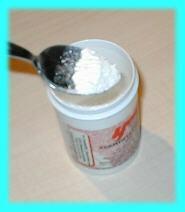 To prevent this a "fermentation stopper" is used, which is a very commonly used food preservative. You should be reading the page as a continuation of a step-by-step wine making guide, if not click here. The first sweetening step is to decant the wine. This involves no more than syphoning the wine into clean fermentation vessels. It's important that the vessels are clean, so use baby's sterilising fluid and then rinse well. I use a wine filter to catch any little bits of sediment that are disturbed, but it's very important that the wine is absolutely clear before trying to sweeten it. Don't expect the filter to do any clearing for you; it won't. Take a look at Step 11, bottling, for syphoning hints. For a sweet wine you will want to add 100g per litre of wine (1lb per UK gallon); add half of this for a medium wine. Put the sugar in a pan and cover with a inch of water. Heat the pan to dissolve the sugar and sterilise the solution. Heating to very hot will suffice; there is no need to try and boil it. In order to stop the sugar re-starting the fermentation add some potassium sorbate. This is sold in most wine-making shops as "fermentation stopper". 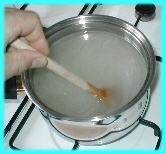 You need to add 1/2 a teaspoon for each UK gallon (4.5 litres) of wine to the dissolved sugar. Do not attempt to leave out this preservative or the wine will continue to ferment. Now pour the sugar solution in with the wine and add one crushed Campden tablet per UK gallon, as you did to the original wine juice back in Step 7. Put a fermentation lock on the vessel and leave it at room temperature for 24 hours. Then continue from Step 11, bottling.